If it feels like there are more complaints than ever, and that you’re spending more time and money dealing with negativity and backlash, you’re right. But the rise of customer complaints represents a huge opportunity. I’d love your support in this critical pre-order phase. Thanks. I partnered with Tom Webster’s firm — the highly respected attitude collection group Edison Research – to take a close look at the current state of hate. We discussed customer service expectations and outcomes with more than 2,000 American consumers who have complained about a company in the previous twelve months. This is true in all channels, but the impact is greater in online service, where unhappy customers don’t necessarily expect companies to respond. Answering customer complaints in social media, review sites, and forums blows their minds and wins their hearts. You need to interact with your customers in the channels of THEIR prefer, not just those YOU prefer. 80% of businesses say they deliver exceptional customer service. Just 8% of their customers agree. That’s why we can so easily name companies that deliver exceptional service: Zappos, Nordstrom’s, Ritz Carlton, etc. We know them because they are RARE. Too rare. 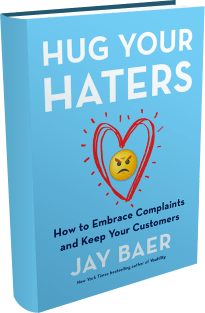 Hugging your haters and answering every customer complaint (especially online) can be a massive competitive differentiator, and I prove that case in the book with a ton of research and more than 50 interviews. Being great at customer service isn’t easy, but it is critically important – much more so than most businesses acknowledge. Because the hard truth is this: your competitors can steal your best people. Then can copy your products. They can mimic your website. They can adopt your marketing playbook too. But the one thing your competitors can never steal, the one thing that is yours and yours alone is if you genuinely care more about your customers than they do. If you are simply willing to answer every complaint you’ll be the leader of whatever pack you find yourself in today. I hope you’ll grab copies of the book, which includes a full-color poster, specific processes for handling online and offline haters, dozens of inspirational case studies and stories, and a lot more.